WOW! OVERLOAD is the right word at the moment. Fried Ice Cream is listed as "Cinnamon caramel light ice cream swirled with honey caramel with cinnamon tostada pieces". Let's just say I feel a little off right now. Granted it is very humid, and the overload was still warm from the trip back from Walmart ....and maybe I ate it a smidge too fast, but whoa, I'm on overload myself. I didn't even eat that much! I love cinnamon, but in this case it's too much of a good thing, or maybe it's too much caramel, iunno. It is a light ice cream, but that's not what is getting to me ...something ain't right. I'm going to let it refreeze overnight and I'll second scoop it tomorrow. On Second Scoop: I'm sorry, but this just isn't working for me. I'm wondering if it's the honey caramel swirl that throws this ice cream just a bit too far into sweet territory. The tostada pieces also do nothing for me. I just can't recommend this one. 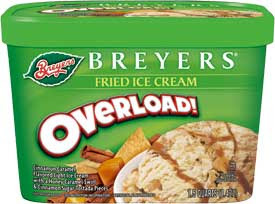 2011 Update: Sorry, this one didn't make the transistion to Breyers BLASTS! Too bad. I actually liked this ice cream quite a bit. Of course, the experience is a far cry from eating ACTUAL fried ice cream, but given the obvious limitations under which Breyer's was working, I think they did a hell of a job. I like the ice cream flavor pretty well, but I really did not like the texture of the fried tostada pieces - they were pretty chewy. Now if they coated the tostada bits with chocolate as Breyer's did in their waffle cone ice cream, that would have been better, I think, although more caloric. I also enjoyed this ice cream very much I am truly bummed.